Leadership opportunities for Mental Health Nurses in the field of disaster preparation, response, and recovery. Disasters occur internationally and are nondiscriminatory. The loss resulting from the destruction associated with disasters leads to the development of various levels of psychological trauma in survivors. Health teams provide assistance to survivors before, during and after disasters, and mental health nurses make an important contribution to these teams. However, the leadership role of mental health nurses in disaster situations has not been extensively explored in the literature. 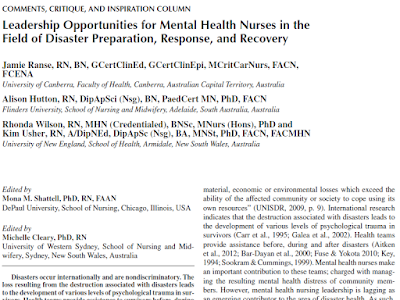 This article discusses aspects of mental health nursing leadership in preparation for, response to and recovery from disasters. In particular, recommendations are made to enhance the leadership of mental health nurses in the context of disasters. Ranse J, Hutton A, Wilson R, Usher K. (2015). 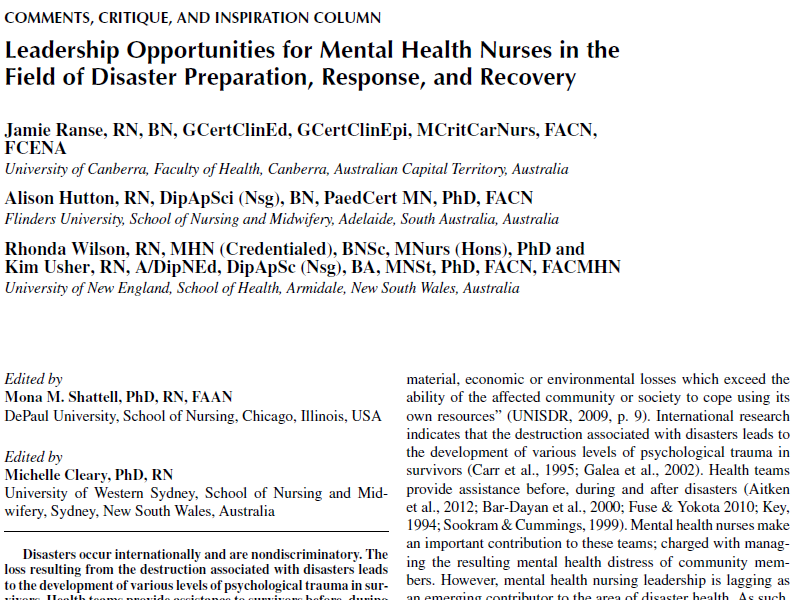 Leadership opportunities for Mental Health Nurses in the field of disaster preparation, response and recovery. Issues in Mental Health Nursing.36(5):391-394.